Last week I had the great pleasure to attend the Healing Art of Writing Conference/Workshop, offered at Dominican University here in San Rafael and organized/led by Dr. David Watts, a poet and UCSF GI doc. What can I tell you about this event? When I first saw the information about the conference (shared by Dr. Aronson at USCF, who runs the Medical Humanities listserv there), it felt like the absolute right place to be — a writing conference, about writing and healing and writing as healing? And Jane Hirshfield, Dr. Rachel Remen, John Fox, Terese Svoboda, Robert Hass and other amazing poets/writers/thinkers will be presenting? And it’s at Dominican, just two miles from my new home? Yes, please! However, the conference fee (which, at $700, is completely reasonable for an event of this length and caliber) was out of my budget, and so I thought maybe I’d be able to catch the evening talks or save up for next year’s offering. And then Cindy Perlis, who leads the Art for Recovery program at Mt Zion (where I lead Healing Through Writing workshops with folks living with life-threatening/life-altering illness), asked if I wanted to go. She’d been offered a spot, but couldn’t take it herself. And so it was that on Sunday evening, after a weekend of queer-lib-madness (given that it was the end of Pride week in San Francisco), I found myself on the second floor of Guzman Hall on the Dominican campus, listening to a roomful of healers, poets, novelists, new writers, long-term writers, those living with illness or life-altering physical experiences, nurses, therapists, and doctors introduce themselves to one another. I felt wholly out of my element and terrified (and not a little bit awe-struck). I learned that night that the folks who had signed up for the Prose workshop (as I had) would be expected to share a 10-15 page chunk of their writing with their workshop groups. This was new information for me, and I had to scurry that night to get together the material I wanted to share with my group. What else can I tell you? The Dominican campus is tree-and-deer filled, a peacefully-riotous green. Often during the week I was reminded of being at Goddard, from the reminders to be in one’s own process to the old wood frame buildings, there was something familiar about this place and these healing-focused folks gathered to attend to their own stories, their own writing. What I want to say is that I entered this space the same way I enter the Goddard space every time (be it one of my residencies during my MA years, or whenever I go back for the Power of Words conference): I am, every time, entirely determined to stay closed. I’m not going to open, I’m not going to stretch, I’m not going to cry. Every time I make this determination — I don’t know if it’s a survivor/survival thing or my ego (god bless her) just struggling to assert her dominion, but each time I go to an event that I know must change me, I decide to resist that change. This time around, I felt the pull, that energy, the swelling of promise and possibility on the very first night. I heard each of the other attendees describe themselves as we went around the room and did introductions, I listened to the faculty share their hopes for the week, their expertise and interests, and I thought to myself: I can resist this. I will get what I need without breaking. Now, that’s fear speaking, without question. But you can’t blame an ego for trying! This time around we (my ego and me) lasted all of 12 hours — by 8 the next morning, during John Fox’s Poem as Healer workshop, I was already crying as I listened to the poems he shared, and then as I did my own writing. I had decided to share with my workshop some especially difficult writing, and I was terrified about their response: would they think it too graphically depicted sexual abuse? Would they feel like my writing voice was entirely underwhelming? Would they let me know, in no uncertain terms, that I wasn’t up to the challenge of telling this (my own) story? And so I wrote those fears out onto the page, as I sat out on the cement stoop outside the morning meeting room, and let myself cry. A young security guard came by, his face folded with worry, and asked if everything was all right. Now, no, obviously, things aren’t all right — here’s a woman with a face full of tears! But then, yes, absolutely, on the other hand — I was very much ok. I said, “Yes, I’m ok, I’m just at a writing workshop” — as if that should explain everything. Doesn’t everyone weep at a writing workshop? And so I was broken open, though still quite scared. Our workshop group was made up of strong and brilliant and risk-taking writers from the San Francisco, Sacramento, Oakland, South Bay, Houston, the East Coast, even Australia. Some of these folks are experienced writers and workshoppers, and some are new to both writing and talking about writing. I worried that we’d be doing some old-school, Iowa-style workshop method (which, in my fears, is all about desecrating a work with the idea of building up the writer’s skin, and building up one’s own work in the eyes of the workshop facilitator at the same time. This might not be the true intention of the Iowa method, I’ll grant that.) What I want to tell you about this group is that we created a (yes, ok) sacred space there in the course of that week, where we could be enthusiastic and encouraging about each other’s writing and stories, where we could talk about what we wished for the piece, what folks might want to do to make sections stronger or clearer. We got to be deeply kind and honest with one another, and our various group facilitators (Louis B Jones, Dr. Rachel Remen, Terese Svoboda) each encouraged this in their own way, and I’m so grateful. I got to spend the week immersed in writing as art, as practice, as possibility, as offering. We did two hours of workshopping each morning, and then there were three hours of craft talks most afternoons. Our faculty talked about learning to empathize with one’s characters (Louis B Jones), the importance of compassion in writing (Rachel Remen), seismographic attention (Jane Hirshfield — honestly, I mean just look at that title. so fantastic), and more. Robert Hass talked about (if I can possibly pull the breadth of his talk down into a synposis) the three skepticisms of our time and how they could be considered pathologies (though he wasn’t using “pathology” as a negative phrase, I think, more as a judgment-free assessment), engaging with postmodernism and how it’s changed the way that new writers enter into their work. (An aside: I just figured out last night that I can use the Voice Memo “app” on my iphone like a tape recorder; I wish I’d figured that out *before* the craft talks. I’d like nothing more than to be able to listen to each one several more times.) We attendees got to share our writing with the wider community during participant readings, and had the pleasure of hearing our faculty share their writing during evening faculty readings. A week immersed in kindred community, words and love of words. What an extraordinary gift. In the end, I connected with a number of other healing-writers in the UCSF community, strengthened my relationship with AWA-ers in Sacramentocom (hello Jan & Terri! :) and am hoping that our Prose workshop will continue to be a place to share work and encouragement, even if it’s via email/virtual space rather than in person. And, too, I learned I am up to telling my own story. I had forgotten, maybe (could I have? ), how important that deep-embodied understanding can be, forgotten what it feels like to walk in to a roomful of strangers and offer my words to their new-to-me ears, forgotten what it can be like for folks new to my own writing workshops. I remember now, and I’m so grateful to each of the attendees at last week’s Healing Art of Writing conference, and to each person who’s ever come through the door to one of my workshops, for the risks we take together, and for the transforming power of that risk. as well!) 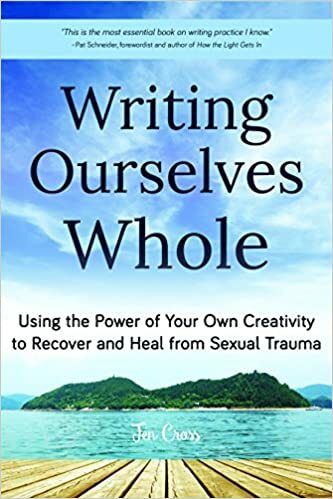 Please write to jennifer@writingourselveswhole.org to register. then, by extension, for ourselves, as we are? to check back in with your embodied self. gender complexity in a healing and playful environment.